Bey Logan has been the foremost expert of Hong Kong cinema, providing some of the best commentary tracks on dvds and blu-rays of all kind of Hong Kong film and his commentary here is excellent. 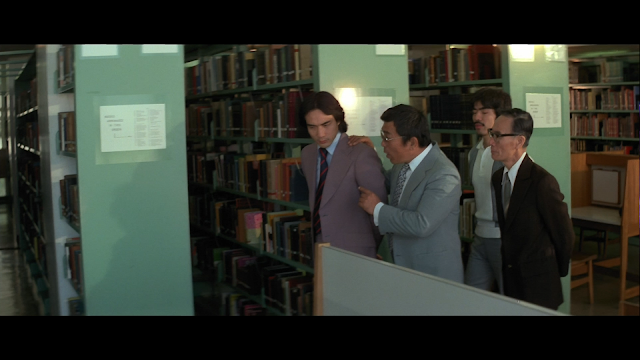 He gives almost anyone in the film a moment by talking about their history. 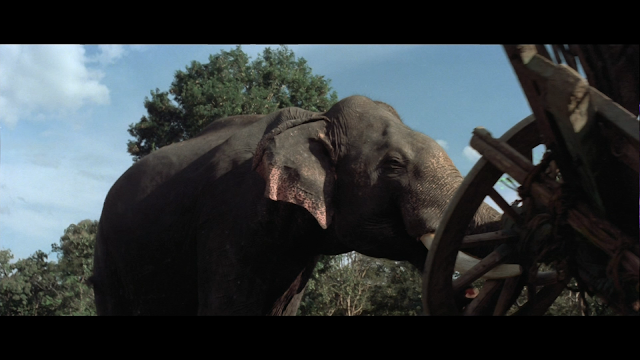 Here he also dives into King Kong and the rip offs. This is a must listen for any fan of the film. The Mighty Peking Man comes to us in a combo (Blu-ray + DVD) pack. The front of the package is the original English language poster for the film. It depicts a few things: the first is the white girl is the biggest thing on this poster. She is holding a pissed off looking cheetah. 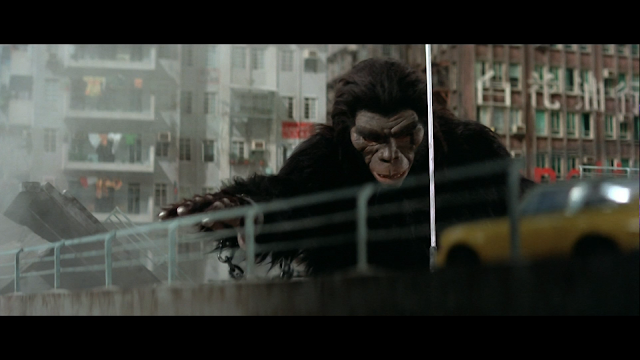 The second is the Mighty Peking Man himself scaring away tons of people as Hong Kong burns in the background, spotlights shine in the air, and helicopters are ready to attack. The third is the title, in yellow as well as being in both English and Chinese. The reverse cover is the same poster only all in Chinese and the title is at the top instead of in the middle. The back cover gives us two portraits: one for each hero. We are also given a description of the film, along with a list of the special features. Technical information and studio logos fill out the bottom of the back cover. Inside there are two disc, one blu-ray and one dvd. Both of the discs have full color artwork. 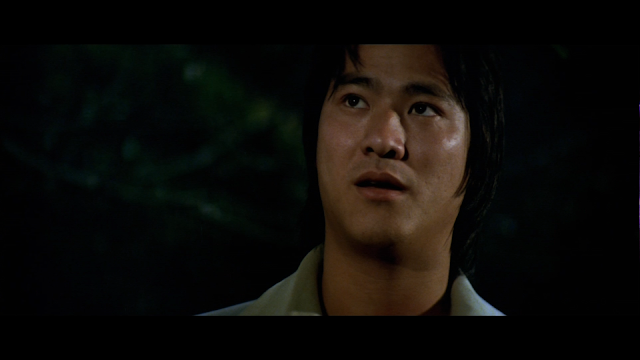 There is also an eight page leaflet with an essay by film critic Calum Waddell about actor Danny Lee. Make sure to read this as it is really good. All of this comes packaged inside of a Criterion-style, clear blu-ray case. The blu-ray is REGION B (locked) and the dvd is REGION TWO. 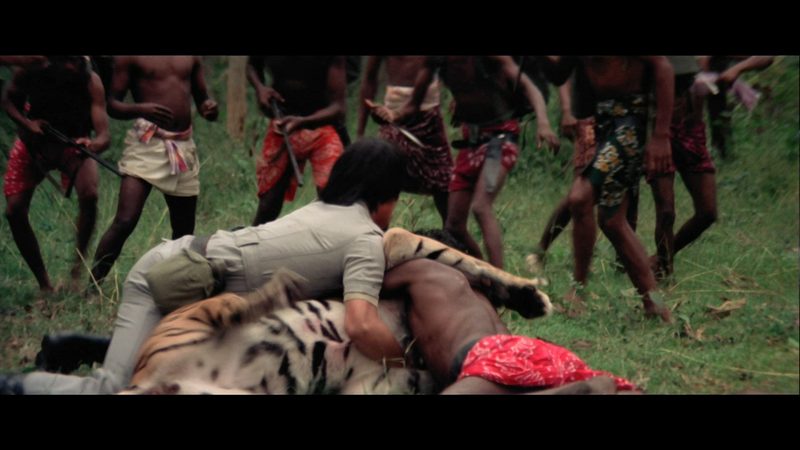 Coming to us from U.K. distributor 88 Films, The Mighty Peking Man looks really good. The 2.35:1 aspect ratio, which was standard for Shaw Brothers films (they called it Shaw Scope) captures the action beautifully. There is a lot detail in close ups, but medium and long shots suffer a bit. The colors are vibrant and blacks are deep. I did see some minor haloing in some shots, but it wasn’t too bad. There is a lack of grain, but I didn’t see any DNR applied here. There is also a sense of depth in the jungle scenes that disappears when we get to Hong Kong. All in all, 88 Films has given The Mighty Peking Man the respect it deserves. We get two audio tracks (three if you count the audio commentary). We get a LPCM 2.0 track for both the English dub and the original Mandarin track. Both tracks sound very similar, but the English track is a bit flatter than the Mandarin track. Watching the English track, I found that it was a bit “tinny” at times, while the Mandarin track seemed a bit fuller. Both tracks are well produced here and it nice to finally here the film with a lossless track. Dialogue is clear and there is no distortion to either track. There are so many King Kong knock-offs that it is hard to put a number on it. 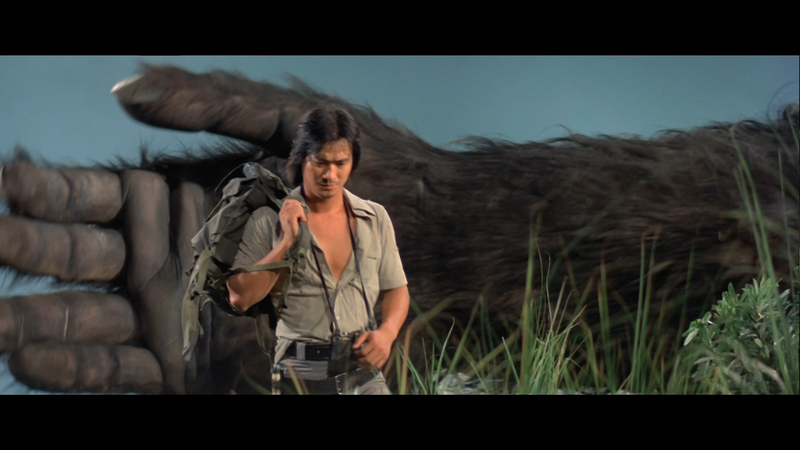 We have had Queen Kong, a Japanese take on Kong that was officially licensed by RKO that was so popular that they put Kong into another film, and today’s feature: The Mighty Peking Man. I had not of this film until 1999 when Harry Knowles, from Ain’t It Cool, was chosen as one of many film critics to fill Gene Siskel’s seat on Siskel & Ebert until a permanent co-host could be found. Around this same time, Quentin Tarantino, through his label Rolling Thunder Pictures, released the film into theaters for a limited run. The weekend the film hit theaters, Knowles and Ebert reviewed it on the show. Both critics gave the film a thumbs up and spoke very highly of the it. 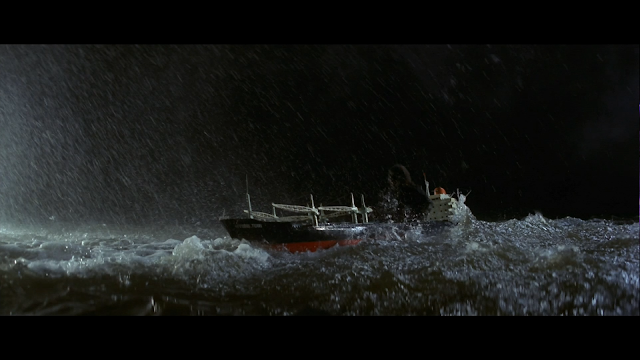 Ebert had a tenancy to like giant monster films so it was not a big surprise when he talked the film up. Based on this review, I knew that I had to see the film. I knew nothing about it, but I too love giant monster films. The film was not released into theaters around where I live so I had to wait until it hit VHS and/or DVD. When it did come out, I invited a group of friends over and we had a blast watching the film. 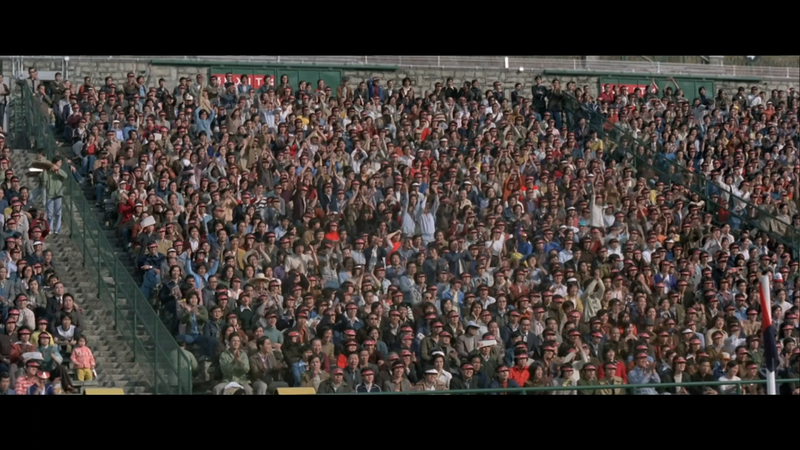 I have seen the film a few times since that night and every time I have more and more fun. The film is the Hong Kong version of King Kong, although the film has more in common with Mighty Joe Young, but there are definite Kong influences too. 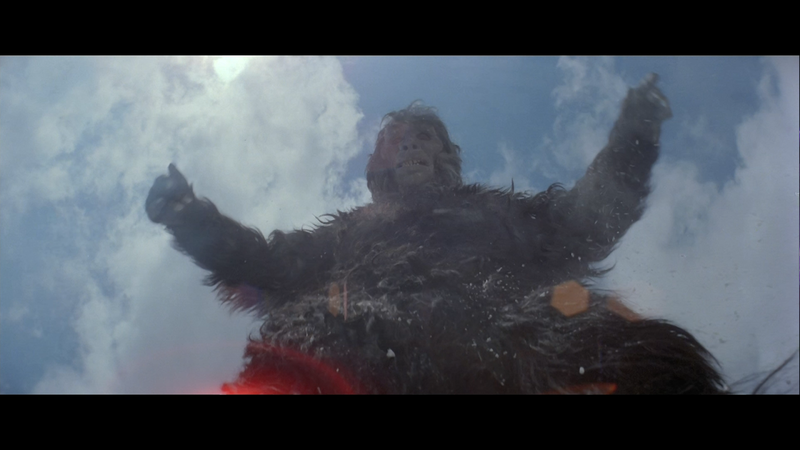 The film opens with The Mighty Peking Man being birthed out of a mountain. A tribe of natives have a village at the bottom of this mountain and Peking Man goes to town on the village. He destroys everything that he sees and kills many of the natives. This is how you start a film. 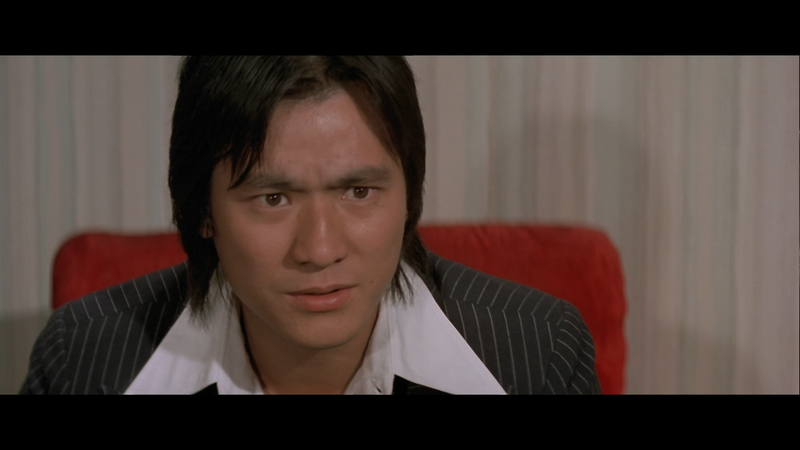 The film’s director, Meng Hua Ho, isn’t messing around. He knows why people paid money to see this film and he makes sure that he delivers within the first five minutes. 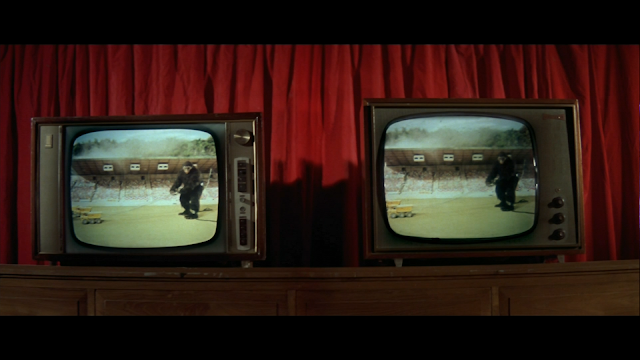 Meng has Peking Man smashing huts, throwing boulders, and smashing people. This is down with a great sense of fun. 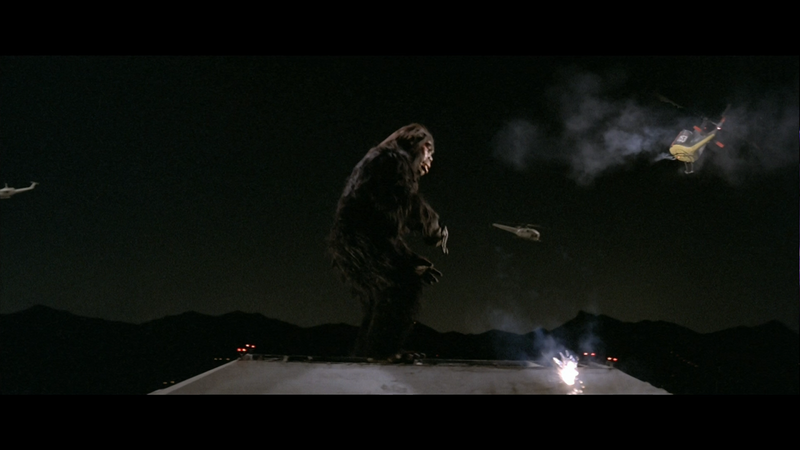 I know, killing is wrong, but when the killer is a giant ape-like creature, it becomes a lot more fun. 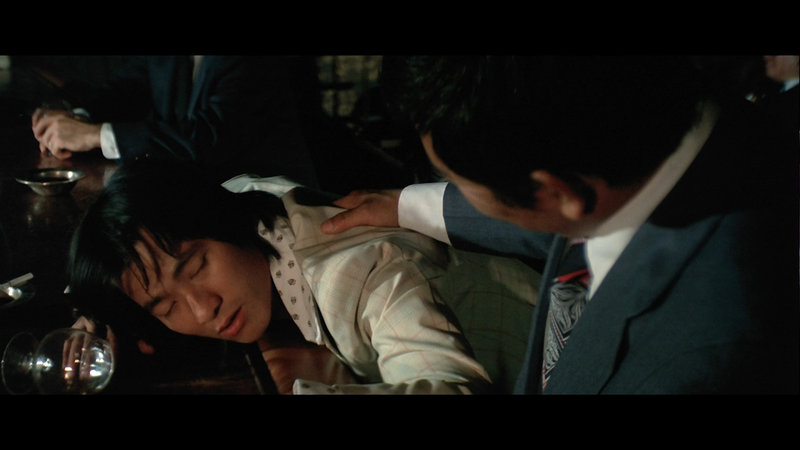 Back in Hong Kong, a sleazy promoter hires Johnnie Fang (Danny Lee) to find and capture Peking Man so that the promoter can put him on display where people will pay tons of money to be able to see Peking Man in person. While on his trek, Fang falls in love with a white girl (Evelyne Kraft) who has been living in the jungle ever since the plane that her and her parents crashed, killing everyone except for the her. Fang lucks out though because not only is the girl hot and wants him, but she is besties with Peking Man. 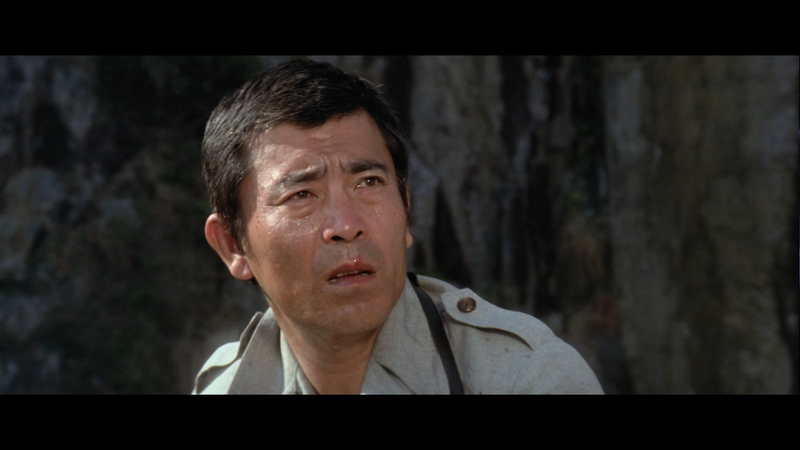 Fang convinces the white girl to bring Peking Man back to Hong Kong because “the whole world wants to see him” The white girl reluctantly agrees. I think that we know how the rest of the film plays out. Peking Man is put on display and falls into a depression until he sees the white girl about to be raped by the sleazy promoter. Peking Man wants nothing to do with that and busts out of his chains to save the girl from being sleazed on. 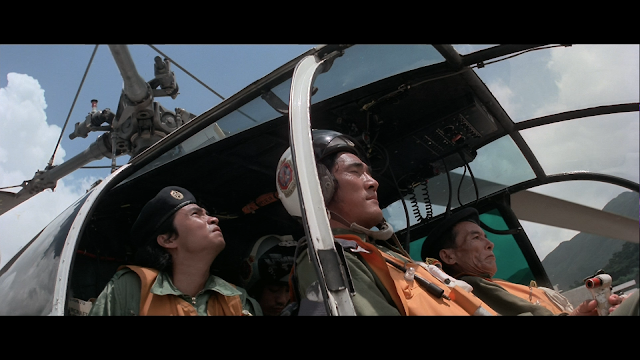 The military is called out after Peking Man destroys some of Hong Kong (probably because the government wanted to see if he would just stop. 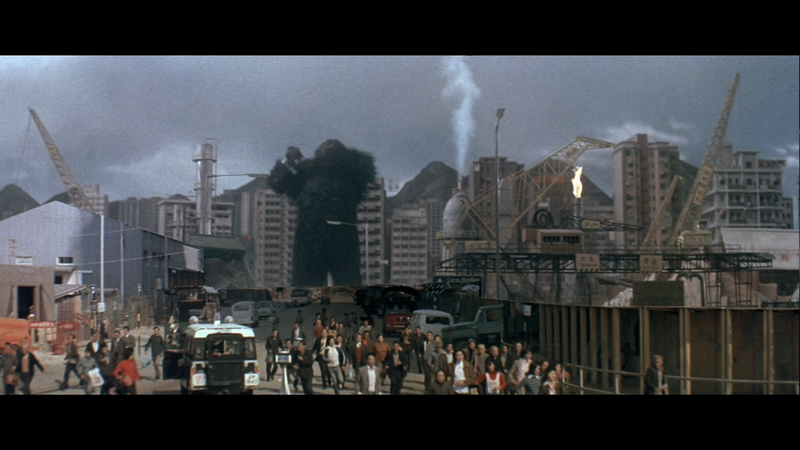 I mean, the military always starts shooting at the giant monsters. Man climbs up the Jardine House to have one final showdown with the military. 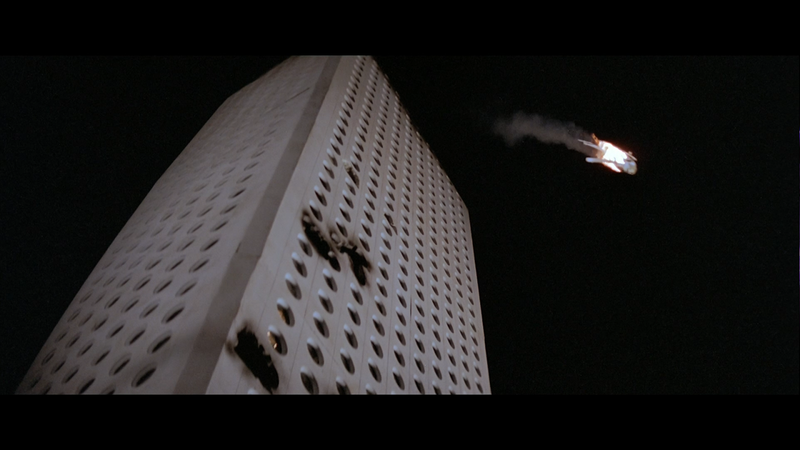 The effects in the film are wonderfully crappy. 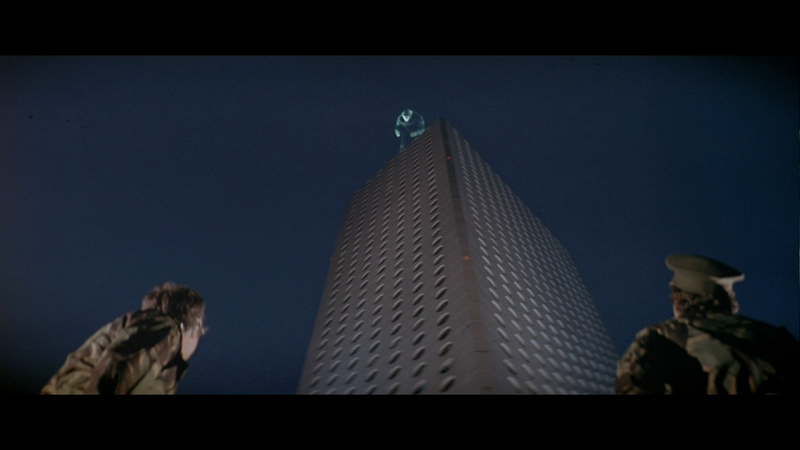 Don’t get me wrong, there are some really nice effects shots in the film (like when the Peking Man is standing atop the Jardine House and the helicopters are flying around him. The helicopters are fake as hell, but the way that the backdrop and the foreground are filmed it looks like he is actually standing on a building way up in the air. The rest of the effects shots are pretty bad. Foreground and background projection is hazy and blurry. The shots of the Peking Man climbing the Jardine House are some of the worst composite shots I have ever seen, and you can see the actor who is playing Peking Man’s teeth and skin around the eyes. There are also some scenes with real life, dangerous animals. The white girl is friends with every animal in the jungle, except for snakes, and I found it very funny and nerve-racking watching the actress swing a live cheetah around like they were dancing. There is a funny bit, though, where the white girl gets bitten by a snake. Fang throws the snake into the jungle so that he can help save the white girl. The snake tries to get away, but a tiger comes in and starts fighting the snake. This scene goes on for a minute or two and is one of the funniest scenes in the film. 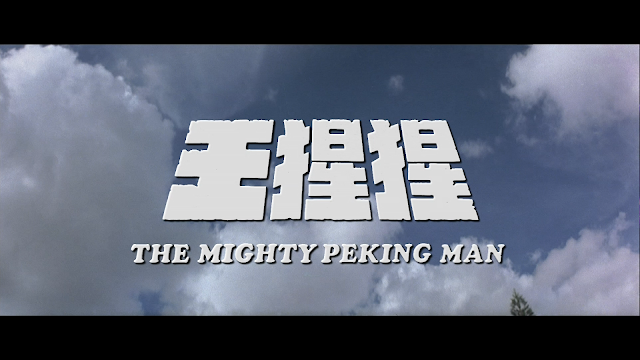 If you can’t already tell, I love The Mighty Peking Man. I have ever since I watched the first time. This latest viewing was extra fun because I hadn’t seen the film in a few years. It was nice to catch up with an old friend. I can recommend this film to almost anyone. The film is a hell of a good time and is worth checking out. 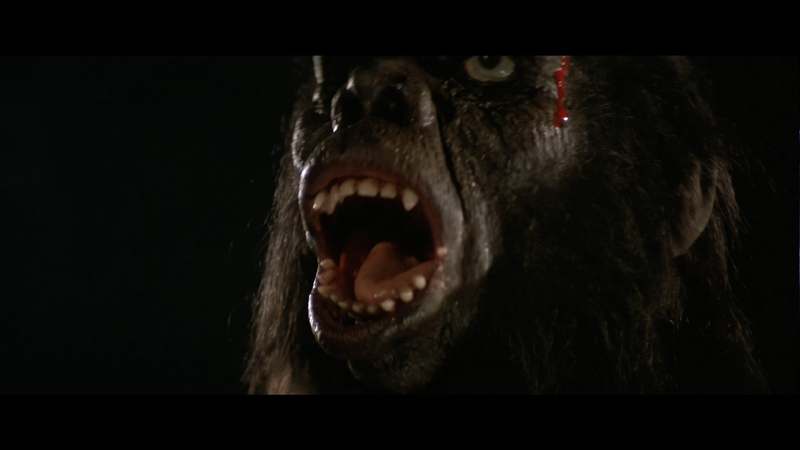 The Mighty Peking Man is a helluva good time. The film is funny and exciting. The effects are all over the place, but that adds to the film's charm. 88 Films have given us a great blu-ray. The picture quality is fantastic and the sound is nice. The special features may appear to be lacking, but the commentary with Bey Logan is worth the listen. I hope that 88 Films keeps this trend up with future releases.